Our mission is to provide quality holistic care in a compassionate, professional environment. Our ideal vision is to keep our patients’ bodies in balance and prevent health issues whenever possible. By practicing a unique blend of traditional and complementary medicine, we effectively treat health concerns when they arise. We encourage pet owners to be actively involved in their pet’s health. Working as a team, we can achieve our goal to keep your pet healthy and happy! Here at the Wellness Center, treatments are not limited to either strictly traditional or strictly “alternative” methods. Rather, we recommend an integrated approach, taking into account all potential treatment options. For example, an arthritic pet may be treated with both non-steroidal prescription medications, and also acupuncture and Chinese herbs. We have found that using this truly "holistic" approach leads to the best outcomes for our patients, no matter what condition we are treating. We are proud to offer house calls to Washington County, bringing the quality care from our hospital directly to your home. House calls are currently offered on Tuesday and Thursday. Only one travel fee is charged per visit, regardless of the number of pets – split the fee with your neighbors and save! Please call the hospital for more details or to schedule an appointment. "People should be this fortunate when they go to their own physicians for health issues. 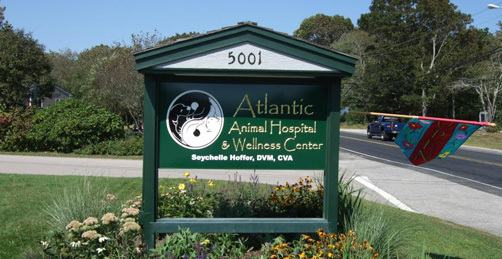 Dr. Hoffer and her staff take the time to listen with compassion, and are very knowledgeable about new trends in veterinary medicine." 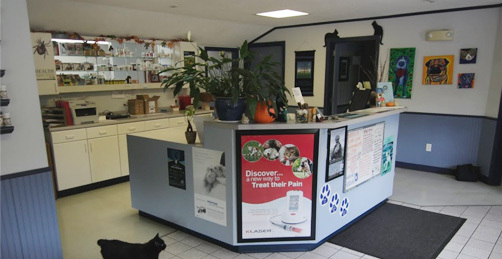 "I love the art work, the hanging plants inside, the free-roaming kitties...the environment is a lot less "clinic" looking and presents a more welcoming appearance." "This is an awesome place for animals! The vets and techs are wonderful. They integrate both eastern and western approaches with herbs, acupuncture and traditional medications. They prescribe herbs first for conditions that can be treated with herbs first. If only I could find this level of care for myself."